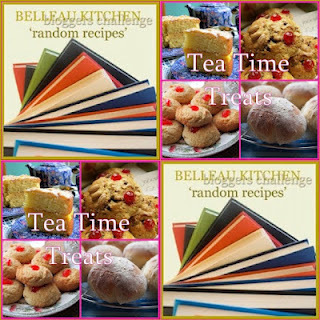 This month's Random Recipes challenge, hosted by Dom at Belleau Kitchen, has joined forces with Tea Time Treats via Karen at Lavender and Lovage and Kate at What Kate Baked. The idea was to randomly pick a tea time treat to cook and then blog about. So for me, the book that this challenge fell to was 'The Tea Time Cookbook' by Valerie Ferguson (although Amazon have it under a different title). It's in some ways an odd little book, with a mixture of recipes covering cakes, cookies, pies and tarts, breads, jams and jellies and then a section on decorated party cakes. Recipes are contributed by a number of authors, including Angela Boggiano, Roz Denny and Jeni Wright. Some of the content seems a bit dated - it was first published in 2007 - but I guess, though, that you'd be spoilt for choice when choosing something for tea. When I opened it, the recipe that the book chose for me was one for Chocolate Profiteroles. I was pretty pleased with this. I have made choux pastry once before, when I did the pastry introduction course at Eckington Manor back in March. I've wanted to try it again but just haven't got around to it. This recipe intrigued me, though, as it uses cocoa powder to flavour the choux buns. I have to be honest though - this did not turn out to be one of my favourite recipes. Following the instructions in the book (to bake at 200 Fan / 220 Conventional / Gas 7 for 35-40 minutes) led to some severely overbaked choux pellets that could have been used for the shot put in the Olympics. They were inedible. That being the case, I took some poetic license and reverted to the recipe sheet I was given at Eckington Manor. Baking at 175 Fan for 25 minutes gave a much better result. Sadly, by this time, I had only enough choux paste to make 5 profiteroles and one tiny little taster bun. The cream filling is simply double cream whipped to soft peaks with a little icing sugar, and some mashed raspberries mixed through. The chocolate sauce is a simple chocolate and cream ganache. Preheat the oven - I used 175 Fan. Sift the flour and cocoa powder into a bowl and set aside. Put the water, butter, sugar and salt into a saucepan and bring to a boil. Remove from the heat and add the flour mix all in one go, and stir vigorously until the mixture comes away form the sides of the pan. Place back over the heat for 1 minute, stirring constantly, so that the flour has time to cook out. Remove from the heat. In a jug, lightly beat together the eggs to mix, and then a little at a time, beat them into the flour mixture. You may not need all the eggs (I did) so stop when you get a smooth, glossy mix that has a dropping consistency. Place the mixture in a piping bag and pipe buns 2 inches apart on a lined baking tray. You can use a dampened finger to gently pat the little peaks flat. So for the batch that actually turned out OK, I then baked them in the oven for 25 minutes at 175 Fan. Took them out and cut them in half, then replaced them in the oven for five further minutes to dry them out. Remove and then put on a wire rack to cool completely. I then filled them with the raspberry cream - whip the cream until the soft peak stage. Mash the raspberries with the icing sugar and then fold this gently through the cream. place a scoop of the cream on the bottom half of one of the choux buns, and cover with the top. To make the ganache, place the chocolate and cream in a bowl over a saucepan of gently simmering water. Heat gently until it melts, stirring to mix. Leave to cool a bit but then spoon over the choux buns to form the sauce. As well as Random Recipes does Tea Time Treats, I'm also sending this to Ros at More Than Occasional Baker and Caroline at Caroline Makes, for Alphabakes, as the letter this month is 'P'. I still love the idea of Chocolate Profiteroles which have a double dose of chocolate via the choux, but think this recipe could usefully be tweaked a bit. The choux was almost too chocolatey, and the first batch made at the higher temperature were decidedly bitter. The raspberry cream was lovely though, and complemented the dark chocolate ganache. It was just like a big 'ol flavour bomb going off in my mouth. So I may just have to have an experiment! Hi, I got here in the end:-) I was just wanting to say that you executed these profiteroles beautifully but the recipe let you down. I think this is one or the roles of us food bloggers to point out the pitfalls with recipes. I know it's why I started my blog because I was fed up with the number of recipes that simply didn't work. As you say the cocoa balance is a bit too heavy so I'm sure that if you had a plain profiterole the light cream and raspberries would be a lovely contrast to the chocolate ganache! Lovely blog by the way! Hi Camilla - thanks for your patience! And thanks for your comment. I know exactly what you mean - I think it's just as important to point out when things don't work as when they do. I always try and figure out what I could do to try and make it work though, and can get a bit rambly then. But I hate it when you have shelled out for a fairly expensive cookery book and there is something wrong with the recipe, or even typos in a crucial place that affect the whole thing. Oh my goodness, I am not a profiterole fan but these look delicious. My other half would love these! Wowzers!! I would have given up at shoux!! Well done you for persevering. They look glorious and the raspberry cream sounds lush doesn't it? Thanks do much for taking part this month and clearly having so much fun? Oh my, these look incredible, don't burst my bubble by saying they weren't good! Chocolate choux sounds interesting. I love profiteroles with lots of chocolate sauce so these sound delicious even though the recipe was a bit disappointing. Hi Jen - thanks for stopping by and for your comment. Yes - shame. But 'oh well', sometimes that's the way the cookie crumbles, so to speak. What a shame the first ones didn't turn out so well - they do look great! Thanks for entering these in Alphabakes. These look stunning! It's a shame the recipe didn't really work for you though. I love the idea of chocolate choux pastry especially with a raspberry whipped cream. By the way, the blue and green jugs in my post are Johnson Brothers Cloud. I'm on the look out for a Cloud teapot as they're ridiculously cute. Thanks Jo. I thought it was a brilliant idea to have chocolate choux but I would be intrigued to see another recipe for comparison, just to see if the ratio of cocoa was right. I agree with you about "exposing" the faults in some recipe books or magazines! But anyway they do look yummy and I would really like to try your version of the recipe!! I would take one of those big ol' flavour bombs, please! Thank you! We don't have raspberries any longer, but I love the combo of ornage and chocolate, so perhaps an orange flavoured cream filling and orange zest atop that ganache would fit the bill during the winter! Bookmarked this recipe ... thanks! Wow - chocolate and orange would be a glorious combination. Maybe with candied orange zest? Now that's got my imagination going! Had a cookbook recipe fail last week for a post I was doing...gotta love when that happens(or something like that). They still look amazing! Hi Amanda - thanks for visiting. It's a bit dissapointing, isn't it? But then I quite enjoy trying to puzzle out why something went wrong - was it me or the recipe? What could I change next time? Or simply just trying to think how I could adapt and improve on something. Glad you had some mixture left for take 2 - they look really lovely! Whenever chocolate and raspberry come together it can never be bad, these look suuuuper delish Susie! Sorry for dropping by so late - belated thanks for entering them to AlphaBakes. I love profiteroles and this chocolate and raspberry combination looks and sounds divine!! It's a shame the first ones didnt work out but I'm so glad your persevered otherwise we would have missed this amazing creation. I've not made choux pastry for a long while - might be time to revisit it.